Many parents want to talk to their children about climate change and protecting our planet, but don’t know where to start. “Is this my home?”, a new children’s book and online universe, lends them a helping hand. "Is this my home?" is a new book and online universe from Ørsted to help parents talk to children about climate change. COPENHAGEN, Denmark, Mar. 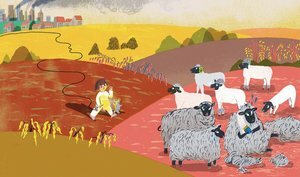 21 /CSRwire/ - Through the eyes of a little girl and the wonderful creatures she meets, the book “Is this my home?” shows why we must care for our common home, planet Earth. It’s an important message for children – and their parents. An international survey of parents’ attitudes towards climate change, commissioned by renewable energy company Ørsted, revealed that 58% of parents with young children would like to speak more about climate change with their children. Yet less than one third of these parents spoke to their children about climate change more than once a month because they did not know enough about it. ‘Is this my home?’, which is produced by Ørsted, wants to help parents talk to their children about climate change, and empower children to take actions that help preserve our planet. Why should parents talk to their children about climate change? Filip Engel: There are signs all around us that global climate is changing, be it more frequent wildfires and floods, or retreating Arctic glaciers and decreased snow cover. Parents can help their children understand why their world is changing in this way. They can tell their children that grown-ups are trying to tackle the climate problem and help them take green actions every day to preserve our beautiful planet. What can children do about climate change? Having said that, parents can still help their children to tackle climate change by reducing their family’s carbon footprint. They can do that through simple every day activities like sorting their household trash, recycling their old toys, books and clothes, and eat more locally-grown fruit and greens. Young children learn by copying their parents, so it’s never too early to start adopting these good, sustainable habits. How do parents in the USA view climate change? In the US part of the survey commissioned by Ørsted, 30% of parents responded that climate change made them worry about their children's future. 60% wanted to speak with their children about how to fight climate change and 42% of the respondents’ children had asked them about climate change. “Is this my home?” could provide these parents, and many others in the US and elsewhere, a great place to start the conversation with their kids around climate change. Why did Ørsted produce “Is this my home?" The prevailing narrative on climate change can be rather gloomy and abstract. With “Is this my home?” we want to provide a positive, simple way for parents to talk to children about climate change and to tell them about the things we can all do to help take care of our common home. *Based on data in the Bloomberg New Energy Finance 2H 2018 LCOE Update report, using current levelized cost of energy mid scenarios for the mentioned technologies. 'Is This My Home?' is illustrated by award-winning South Korean artist Yeji Yun and created jointly by Ørsted and Wieden+Kennedy Amsterdam. Aimed at 5-to-8 year olds, the book is available for free download, with an accompanying online universe of facts about climate change and tips on taking every day green action. The USA part of the survey was conducted online by email in November 2018 and is based on a random sample of 502 respondents who were parents of children aged 5-10 years. Ørsted’s vision is a world that runs entirely on green energy. The company develops, constructs and operates offshore and onshore wind farms, bioenergy plants and innovative waste-to-energy solutions and provides smart energy products to its customers. Headquartered in Denmark, Ørsted’s 2018 revenue was DKK 76.9bn (approx. USD 11.7 bn). 75% of Ørsted’s energy generation in 2018 was from renewable sources. This will rise to 99% in 2025. Ørsted's offshore wind farms bring green energy to more than 12mn people a year, create 180,000 job years in their lifetimes, and help avoid 6.3mn tonnes carbon emissions annually, thereby helping progress UN Sustainable Development Goals 7, 8 and 13, respectively. Ørsted is ranked the world’s most sustainable energy company and fourth most sustainable company overall in the Global100 index.